There are many ways to experience the beauty and majesty of Washington DC. 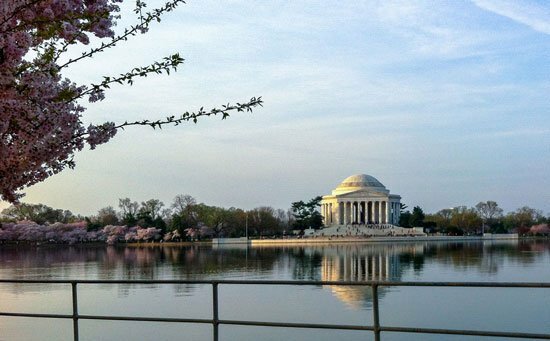 One that very few visitors experience is an early morning view of the Potomac River Tidal Basin. 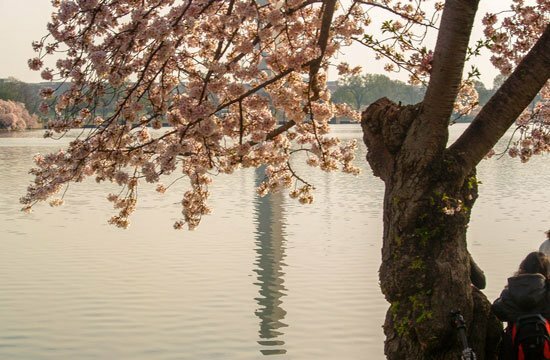 The reflected image of our nation’s most famous monuments and memorials can be seen alongside the incredibly beautiful local icons such as this cherry tree that resembles a Lady in a Tree. The Jefferson Memorial sits at the edge of the Potomac River’s tidal basin surrounded by cherry trees and is a focal point for an early morning walk. The memorial was built between 1939 and 1943 during the Second World War. 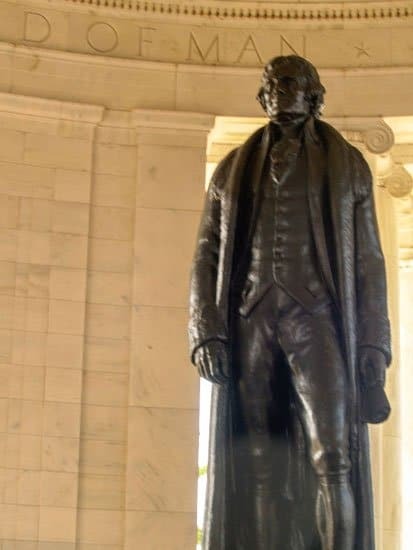 The statue of President Thomas Jefferson was originally a plaster cast of the sculpture by Rudulph Evans and painted to have a bronze appearance. In 1947 the current bronze statue was placed inside the memorial. Although the memorial is popular as a feature of Washington DC, it is not without controversy. The Commission of Fine Arts actively opposed its construction as its placement was not consistent with the original planning of street layouts for Washington DC by L’Enfant. President Roosevelt dedicated the memorial on April 13, 1943 corresponding with the 200th anniversary of the birth of Thomas Jefferson. 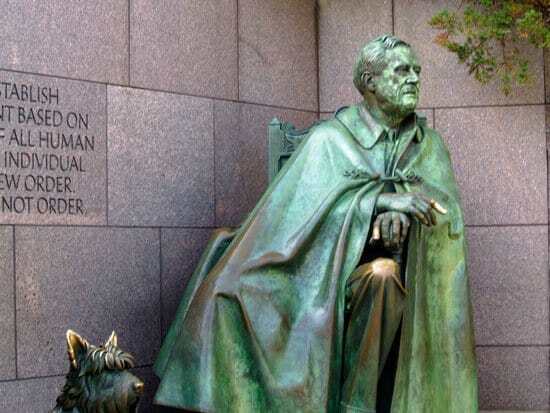 Nearby, the Franklin Roosevelt Memorial sits adjacent to the Potomac River’s tidal basin. This memorial honors President Franklin D. Roosevelt and amplifies the tumultuous years that he served as our nation’s president. 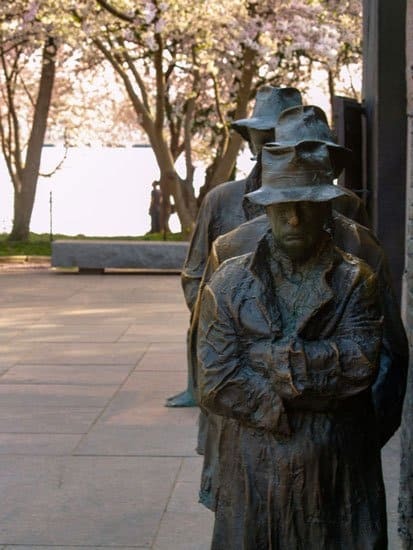 Dedicated on May 2, 1997, by President Bill Clinton, the memorial has a series of sculptures that honor the Great Depression, President Roosevelt in a wheelchair, and First Lady Eleanor Roosevelt. The sculpture of President Roosevelt in a chair brought controversy concerning the acknowledgment of his disability. The sculpture was revised to include two castor wheels at the back of the chair. One of the sculptures depicts a line of men looking for work amid the Great Depression (1929 to 1939). 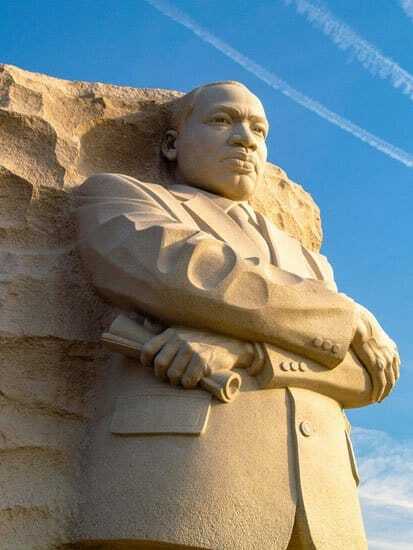 The Martin Luther King Jr. Memorial stands next to the National Mall near the Potomac River’s tidal basin. The memorial honors Martin Luther King Jr. as a national figure who was instrumental in the Civil Rights movement during the mid-1960s. The monument draws on many aspects of his “I Have a Dream” speech which was first presented on the steps of the Lincoln Memorial in 1963. The monument shown in this photo honors his words “Out of a mountain of despair, a stone of hope”. I experienced some incredibly breathtaking images and learned about the history of Washington DC and America as I began a day of discovery with my early morning walk. You can do this too. Plan for a couple of hours to make the entire loop around the tidal basin at a steady walking pace. 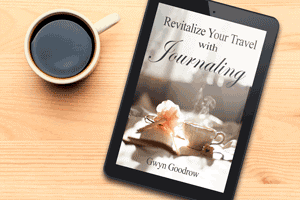 Allow extra time for exploring the detour paths and the many monuments along the route.